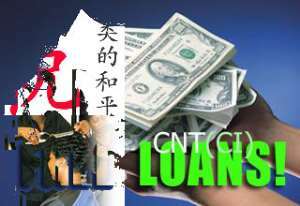 Even though he would not be drawn into detailed comments on the controversy surrounding the $300 million loan from China New Techniques Construction and Investment Limited (CNTCI), Mr. Osafo-Maafo (MP) took issues with independent enquiries that have traced the address of CNT to a hairdressers' salon in London and what he termed attempts by the opposition National Democratic Congress (NDC) to play the blame game. “Somebody came out with a telephone number which is nowhere on the address given to us…. where the person dreamt that up, I don't know. In these things you must deal with patent documents. We are in touch with lenders and we basically believe in the credibility of the shareholders particularly China Rail and a couple of banks but when we look further into this, we will come out with the facts". Mr. Osafo-Maafo who was expected to formally announce Ghana as one of the 16 countries to benefit from a One billion dollar grant from the Millennium Challenge Account at yesterday's meeting, came under a barrage of questions from journalists on the failure to do “due diligence” on the loan. He claimed that most of the concerns raised about the loan especially in relation to the discrepancies in the fax and telephone numbers that point to an $18 per cut for men and $45 for women hairdressing saloon in the London are not correct. The Finance Minister drew the attention of the media to the fact that the loan facility was laid before Parliament as early as the 9th of March and approved on the 14th of April after enough due diligence, debunking concerns that the issue had been rushed to Parliament. He explained further that certain projects presented to the House took less than three days to be rectified. “Myself, my colleagues, both in the Finance Committee and the floor of the House, had access to the document for over a month. So it becomes a little interesting when people talk about it been rushed”. However, government according to him is in touch with the CNT Group Holdings to gather enough data to correct visible errors as well as react to the numerous concerns raised about their credibility. “I am personally in touch to with them, to get additional information to sanctify the people”, he stated. He disagreed with suggestions that an agreement has been signed and money paid. He also refuted allegations that 4 percent of the amount had been paid, pointing out that even after parliamentary approval of such facilities, there are other demand procedures to fulfill before one can assess the facility. He stressed that government is working hard to obtain grants, loans and other resources for developing the economy at an accelerated pace since the current growth rate of 5.2 percent is not in tandem with the population growth rate of 2.9 percent for a developing country like Ghana. Mr. Osafo-Maafo also dissociated the IFC's Professor Ayensu from the CNT facility.